Our debut showcase night in Belgium (english language)! Comedy set swapping live! The cult hit show where comedians perform their own jokes, then each others'. Chortle Award winner – Best Club Show London. Top five comedy shows of the year (List). Top 10 late nights out at the Fringe (Time Out). Top 25 shows at the Fringe (Comedy.co.uk). Featured on BBC Radio 4 Extra. 'A brilliant format' (Guardian). 'Birth of a new cult comedy night... an undoubted hit' (Chortle.co.uk). 'Spontaneous and anarchic' **** (Fest). 'A truly electric night' **** (Scotsman). 'Action-packed and chaotic' **** (BroadwayBaby.co.uk). 'Deserves more than one visit' **** (One4Review.co.uk). 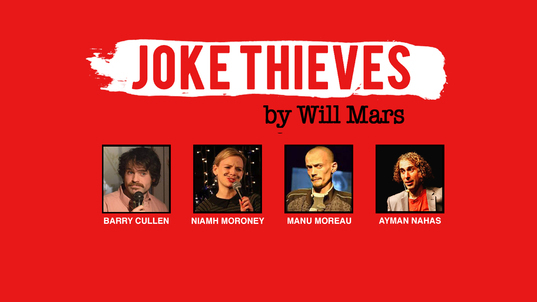 BARRY CULLEN (IRELAND) - "energetic, dry and self depreciating"
MANU MOREAU - "His first steps in comedy weren't so long ago, but every step since has been closely monitored for your safety."